Hi guys! See you again in our website Ada Indonesia. Have you check our instagram (@adaindonesia)? If you haven’t check it, please visit. We are posting also some picture of Ada Indonesia there. Today I want to share a simple recipe that goes well with the recipe that I also shared to you (Keema Matar). Some kind of fusion between Italian food and Indian Food. Sounds strange maybe for Italian people, but I guarantee that you will enjoy it so much. Pour the water into heavy bottom pot and bring to a boil. When it’s boil add coarse salt and olive oil, then add slowly add the corn flour while whisking it with balloon whisk (to avoid any lump). When it’s well mixed, change the balloon whisk into wooden spoon, and keep in mind to mix it in the same direction. Keep mixing every 5 minute and if you think the polenta become hard and difficult to stir, you can add a little bit of hot water. 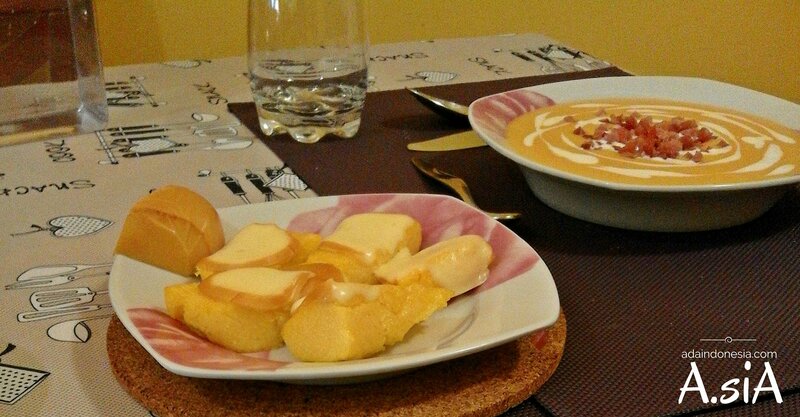 When the cooking time is finish, you can keep cooking around 20 minutes more (because Italian people said, “the longer you cook polenta, the better the taste). But after 40 minutes of cooking you can turn off the fire, and it’s ready to serve. You can eat Polenta while it’s hot or even cold. It depends on your liking. When it’s cold it become a little bit hard and compact, so you can slice it into the size that you want (like it shows in the picture)Don’t forget to try Polenta with Keema Matar. You can find the recipe here in Ada Indonesia.